It is immediately apparent that the audience is going to be treated to a delightful visual feast! The parade’s Santa Claus shows up, thoroughly intoxicated – and the search for a replacement is immediate. 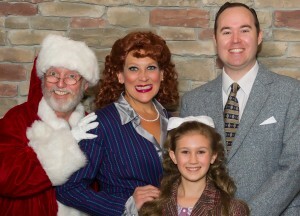 The story revolves around a skeptical little girl, Susan Walker, who has been taught by her Macy-employed mother that there is no Santa Claus. When the mother hires Kris Kringle to replace the drunk Santa, the plot thickens! Some of the music is familiar. “It’s Beginning to Look a Lot Like Christmas” is always fun, and “That Man Over There is Santa Claus,” while not well known, is a true delight! It appears late in the second act, and adds some zip to the show which tends to become lost with too much dialogue! 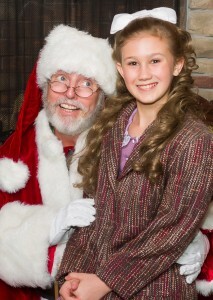 Kris Kringle is played by Tom Mullin. Mullin has substantial experience, but is not yet well known to local audiences. He is especially endearing as the mild-mannered Kringle, wanting everyone to enjoy the Christmas season. The role of the young Susan Walker is double-cast, with Becca Hyde appearing in some performances and Lexi Woolridge in others. I saw Becca Hyde. She is excellent! She sings, she dances, and I could understand every word she said! Her mother in the show, Doris Walker, is played by Annie Dwyer. Fred Gaily, a new neighbor of the Walkers, has returned from military service, and is eager to become friends with the mother and daughter. Scotty Shaffer is well known to local audiences, and continues his string of excellent portrayals as the well-meaning neighbor. The cast is large, with several persons playing more than one role. Particularly good are Thomas Castro, Stephen Charles Turner, Marlin May, and Jack Barton. Jon Tyler Heath and Michelle Sergeeff are impressive as lead dancers in a First Act mini-ballet featuring music from several Christmas carols. The orchestra, conducted by Angela Steiner, includes Ron Pflug, Joyce Shambaugh, Joe Chisholm, Tirling Bowlick, Ryan McGavin, and John Houston Head. The production is directed by Patrick Sawyer. Angela Steiner is music director. Michelle Sergeeff provides the excellent choreography. Jeremy Girard’s work as sound designer and engineer is also excellent. As noted earlier, the set is wonderful, utilizing the skills of Tyler Clark, Casey Kearns and Dustin Harltey. 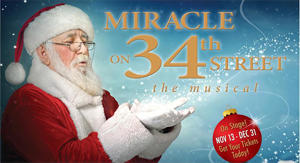 The show is designed to look like a huge Christmas gift to theatergoers in Northern Colorado. It looks terrific, and is hampered only by a less-than-wonderful script and some somewhat-bland songs. Cost: From $52.50 to $59.50 for adults (including meal), depending on date and time of performance. Costs are less for students and children, and for those wishing only the show – no meal.